Foreign and local investors have reposed implicit faith in the Mahinda Chinthana after the dawn of peace. Foreign Direct Investment inflows to Sri Lanka during the first six months of this year were USD 853 million, an unprecedented 58 percent increase. 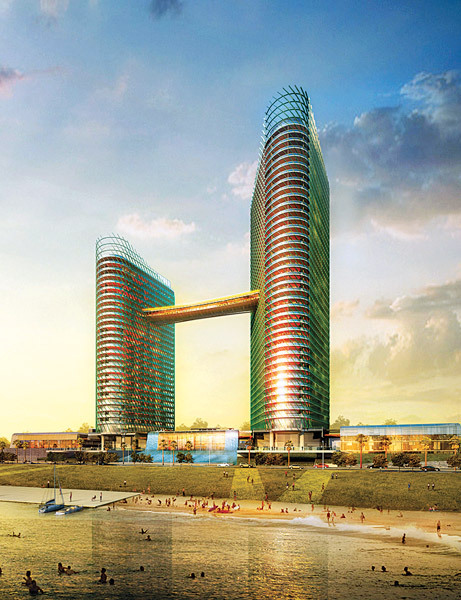 The ITC Colombo One Luxury Hotel and Residencies by ITC Ltd to be built opposite the Galle Face Green will be yet another landmark that confirms the investor confidence Sri Lanka has gained under President Mahinda Rajapaksa’s illustrious leadership. The ground- breaking ceremony of the ITC Colombo One Luxury Hotel and Residencies will be held under the patronage of Economic Development Minister Basil Rajapaksa on Wednesday. Here is an artist’s impression of the latest addition to one of the largest hotel chains in India which owns more than 90 hotels in over 70 countries. Health Minister Maithripala Sirisena told Parliament yesterday that Budget 2015 has provided Rs.180 billion to develop the health sector next year, a Rs.18 billion increase compared to the Rs.162 billion allocation this year. Officials of the Commission on Missing Persons will meet the President’s Secretary Lalith Weeratunga next week to discuss the setting up of a counselling service for relatives of those missing. The President’s Secretary chairs the Committee Monitoring the Implementation of the National Plan of Action of the Lessons Learnt and Reconciliation Commission. The Head of the Toxicology Poisons Information Unit of the National Hospital, Dr Waruna Gunatilleka said hypersensitive users of synthetic hair dyes should be aware of the harmful chemical substances which could seriously undermine their health.